This unique package contains everything a biker needs to revolutionise their ride with their Apple iPhone 6 6S 7 8 4.7". Containing a complete mount solution with tough case, 21-40mm helix swivel strap attachment and a USB cable. Along with step-by-step instructions enclosed, fitting is simple. A great gift for the motorcyclist who wants to safely use their phone as a sat nav and keep connected while on their journey. This beautifully formed package contains everything a biker needs to revolutionise their ride with their Apple iPhone 6 6S 7 8 Plus 5.5". It includes a complete mount solution with tough case, 21-40mm helix swivel strap attachment and a USB cable. Along with step-by-step instructions enclosed, fitting is quick and simple. A perfect starter kit gift for the motorcyclist who wants to safely use their phone as a sat nav and keep connected while on their journey. This unique package contains everything a motorcyclist needs to revolutionise their ride with their Apple iPhone X / Xs. This includes a complete mount solution with a tough IPX5 rated case, a 21-40mm helix swivel strap attachment and a USB charging cable. With step-by-step instructions enclosed, fitting is a simple process. 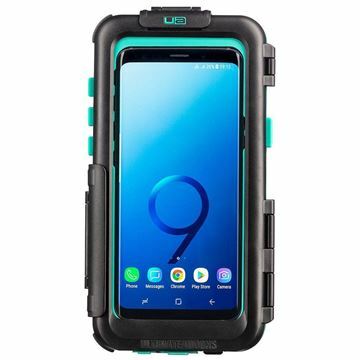 WP TOUGH MOUNT CASE IPHONE 6/6S/7/8 PLUS 5.5"
Ultimateaddons Tough Mount Case range are model specific and this waterproof case is designed specifically for the Samsung Galaxy S9 Smartphone. If you are looking for the best case to mount your Samsung Galaxy S9 onto a motorcycle or bicycle & keep it protected from the elements, powering it while you go, then look no further. Function buttons on the case allow for using volume, on-off and the phones new bixby button. Easy to use function buttons with gloves on. The Tough Mount Case range are model specific and this waterproof case is designed specifically for the Apple iPhone X & Xs Smartphones. Proud to say that If you are looking for the best case to mount your Apple iPhone X or Xs onto a motorcycle, keep it protected to the elements and be able to power as you go then you want this case. 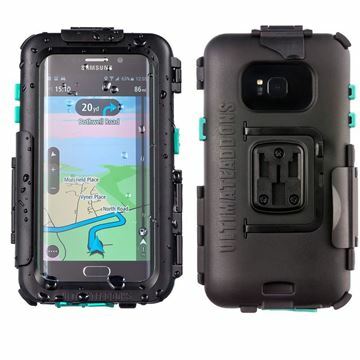 Ultimateaddons Tough Mount Case range are model specific and this waterproof case is designed specifically for the Samsung Galaxy S9 Plus Smartphone. 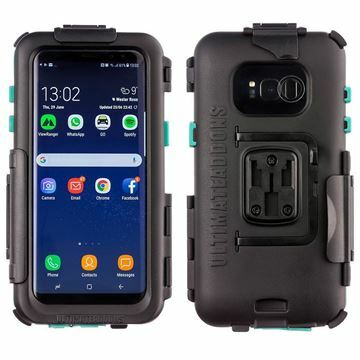 If you are looking for the best case to mount your Samsung Galaxy S9 Plus onto a motorcycle or bicycle & keep it protected from the elements, powering it while you go, then look no further. Function buttons on the case allow for using volume, on-off and the phones new bixby button. Easy to use function buttons while wearing gloves. This motorcycle fork stem mounting attachment is desgined for sports bikes / sports tourers where you have very limited space on the handlebars. Having a mounting point on a sportsbike gives you a lot of possibilities from mounting an action camera to record your track day to recording you touring Europe. This mounting attachment offers a 25mm / 1" ball head connection. If you ride a motorcycle or a scooter where you have limited space on your handlebars these mirror mounting attachments will give you a secure mounting point. This strong metal U-Bolt motorcycle handlebar mounting attachment has a 25mm / 1" ball connector. The Tough Mount Case range are model specific and this waterproof case is designed specifically for the Samsung Galaxy S8 Smartphone. We are proud to say that If you are looking for the best case to mount your Samsung Galaxy S8 onto a motorcycle, keep it protected to the elements and be able to power as you go then you want our case. Some options are available, you may only need the case on it's own, or the option to have a male or female 1" ball adapter plate to fit to some existing mounting kit. 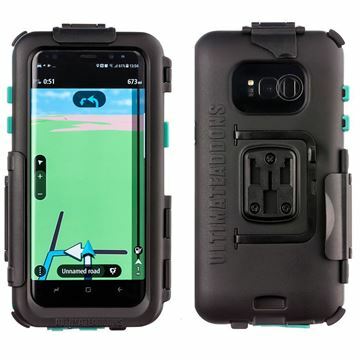 WATERPROOF TOUGH MOUNT CASE IPHONE 6/6S/7/8 4.7"
The Ultimateaddons tough waterproof case for the iPhone 8 (iPhone 6 6s 7 & 8) is ideal for using your iPhone as a sat nav while on your motorcycle. You may only need the case on it's own, or the option to have a male or female 1" ball adapter plate to fit to some existing mounting kit. 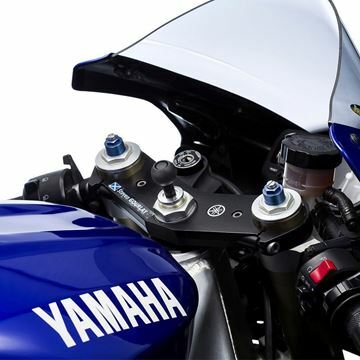 This is one of the most popular 25mm motorcycle mounting attachments. This attachment offers a very neat and tidy solution for mounting a range of devices to your motorcycles handlers. This motorcycle attachment is designed to replace one of the existing handlebar clamp bolts to allow a range of devices to be attached to a motorcycle / scooter. If you ride a motorcycle and have limited space on your handlebars replacing one of the clamp bolts is an ideal solution. Mounting your Samsung Galaxy S7 to your bike will allow you to easily access your smartphone without having to fumble around in your pockets. The Galaxy S7 is capable of running loads of apps that makes cycling better, from recording your trip to finding the best route on strava to listening to music on Spotify. 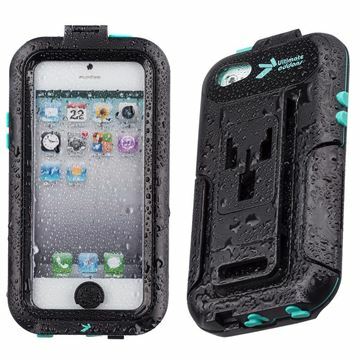 Compact tough hard waterproof mount case has been designed for users to help keep their iPhone 5 5S SE protected while mounted. The case has been designed specifically for the Apple iPhone 5 5s while still allowing for use of all the major phone functions while in this case. T his case will help keep their iPhone 5 5S SE protected during outdoor use. Please note that a bluetooth headset or wired headset is advised to be used for taking calls.